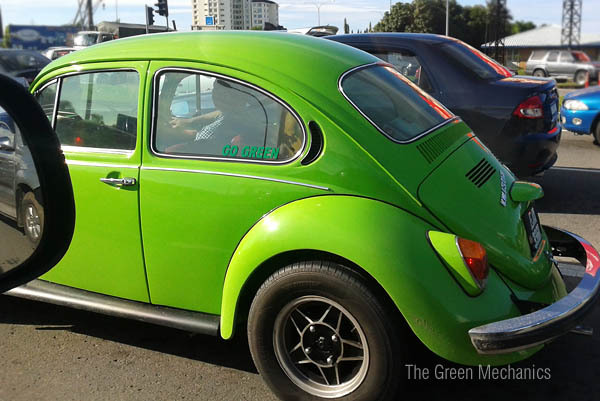 The ever popular Volkswagen Beetle goes literally green with a re-sprayed body and a purposefully worded caption. Not that The Green Beetle is related to The Green Mechanics, but I like the sound of it and it feels right having him on here on Friday's Gone Green section. Not really sure if driving it around is a 'green' idea as it might have efficiency issues as it age up and travel many many miles. ** On a side note, over 21 million of Volkswagen Beetles have been manufactured since 1938, making the rear-wheel drive configuration the longest-running and most-manufactured car of a single design platform, worldwide. New model sells from RM179,888 (approx $56,300) in Malaysia (1.4 TSI), while it's as low as $19,995 in the United States (2.5L).